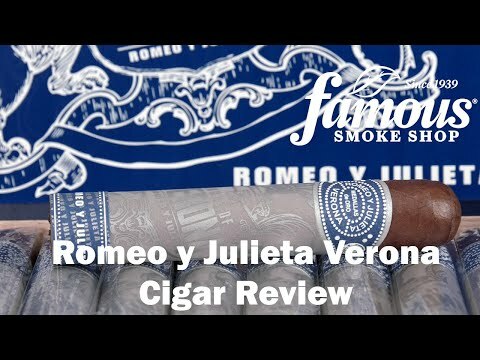 Romeo y Julieta Verona cigars offer you an affordably-priced addition to our select Romeo y Julieta Capulet and Montague collections. This "blue-collared" edition takes its name from the ruling family of Verona (as in the Italian town of the same name), where Shakespeare based his fateful tale of Romeo and Juliet; more specifically, Prince Escalus, the Verona family patriarch and mediator who demanded a peaceful resolution to the ill-fated families of Montague and Capulet. As for the blend, Verona is handcrafted with a palate-pleasing recipe of Dominican, Nicaraguan, and Peruvian long-fillers seamlessly rolled in a dark natural San Andrés wrapper leaf. The smoke is medium-bodied, exceptionally creamy, and loaded with well-balanced notes of earth, cedar, sweet spice, and roasted coffee. Whether you're already fond of cigars with similar attributes, or seeking a savory new addition to your collection, you'll find Romeo y Julieta House of Verona cigars a welcome addition to your prized collection. Presented in five popular sizes, discover this satisfying smoke by adding some to your cart now.